Mauricio Pochettino is a long-term admirer of Alex Ferguson. BELOW IS AN extract from Brave New World: Inside Pochettino’s Spurs by Guillem Balague. In May the season reached its climax and several cycles came to an end. A Tottenham side that nobody expected to finish in the top four battled it out for the championship with Chelsea, and, if they picked up four points, would match the tally with which Leicester won the title the previous year. It was also the culmination of collective and individual goals, while White Hart Lane’s doors were closed for ever. 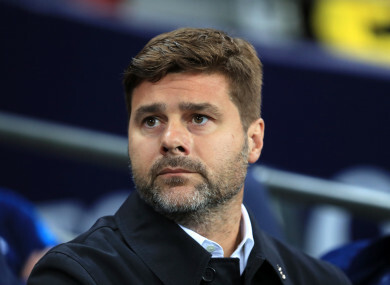 And Pochettino had the chance to put to bed the Newcastle game from the previous campaign in another final-day fixture away to a relegated club. I’ve just started to read Leadership, Sir Alex Ferguson’s latest book. We’ve sent each other the odd text message since that lunch back in May 2016 and I hope that I’ll be able to sit down with him again soon. He may even pay us a visit at the training ground. I said to (Tottenham’s Head of Communications) Simon Felstein, ‘I’m having lunch with Sir Alex.’ As I had my own press conference to attend, I suggested mentioning it to avoid any misunderstandings. Louis van Gaal was walking a tightrope at Old Trafford and our meeting had nothing to do with his future or mine. Simon convinced me not to broach the topic but, to pre-empt any reaction to the meeting, I could reveal that I’d reached a verbal agreement with the club on a new five-year contract, which is what I did. ‘You’ll be photographed with Sir Alex,’ Simon said to me. ‘I imagine so,’ I replied. I’ll always remember each and every detail from those hours of conversation. It was a dream come true. I felt like a teenage footballer all over again, listening to a knowledgeable coach. I sent the photos that we took of us together to everyone. John McDermott commented that I seemed to be in a trance. He called me a ‘hero worshipper’. I knew many details from Ferguson’s career and admired him for the way that he turned United into a successful team, while creating something different in world football. But when I met him, what impressed me most was not so much the CV, but his energy and aura. His character, his charisma engulfs you. I’d love to keep calling on his advice. He spoke to me about how he had to restructure everything when he arrived at United. He did so in keeping with his own philosophy, even though they finished 11th two years out of three, followed by 13th, sixth, second and only after that did he achieve league success. His Manchester United side were like the Tottenham team that I inherited when I took over, and the chat reassured me about following my own path. ‘You play two games each matchday,’ he told me. ‘The first is in the press. Never lose it.’ We’re slightly different in this regard, but I did take note. And at the end of the meal there was, as I thought there would be, a fight to pay the bill. I wanted to do it, and so did Sir Alex. But he had planned this beforehand so he proposed a solution. ‘I will ask you a question,’ he said. I smiled. ‘If you get it right, you pay. If not, I pay.’ I suspected that he must have thought of something hard to get so that I would have to admit defeat. But I accepted the challenge. This time I laughed loudly. ‘Carlos Peucelle and Guillermo Stábile,’ I answered. Ferguson started clapping and shaking his head. ‘Well done, well done . . .’ I proceeded to pay. Why aren’t there more Fergusons? Because football is like an express train without any stops. It’s almost impossible to find someone in charge who is willing to be involved in taking unpopular measures. Sir Alex always says, ‘Many times you have to make decisions that screw you over emotionally, that won’t be understood and you won’t be able to explain.’ I agree. Managers live in a perpetual state of solitude, even when surrounded by people at all hours. After beating Arsenal, Daniel and I celebrated the fact that we were going to finish above our historic rivals for the first time in over two decades. It wasn’t our aim, but you have to stop and enjoy the good moments, even if only briefly. Brave New World: Inside Pochettino’s Spurs by Guillem Balague is published by Orion Books. More info here. Email “"I said: 'I'm having lunch with Sir Alex'... I felt like a teenage footballer all over again"”. Feedback on “"I said: 'I'm having lunch with Sir Alex'... I felt like a teenage footballer all over again"”.